DESCRIPTION OF ITEM 1: Hamburger 360 Degree Speaker is a compact travel speaker with big sounds! Using a revolutionary accordion style build, this little speaker opens up to create a chamber that produces resonant sound with amazing bass and clarity for a speaker of its size. It really needs to be heard to be believed!This superbly designed speaker is also powered by internal re-chargeable batteries that will keep belting out tunes for up to 8 hours and charge conveniently via Mini USB port.The Hamburger 360 Degree Speaker has pocket-sized portability with a huge bass chamber and compact cone design to create a large sound.With an internal built rechargeable li-ion battery this speaker will give you up to 8 hours of play time and also includes an LED power indicator. This 360 degree speaker projects fantastic sound in all directions and works with any audio source with a 3.5mm headphone jack such as iPods, MP3 players and laptops. Integrates a cone design with a custom-built speaker to project sound in all directions. DESCRIPTION OF ITEM 2: Wouldn't it be great if you could watch a full-length movie on your Cell Phone without having to hold it in your hands the entire time? This stand is a plastic folding stand that you can tuck away in your wallet for quick access whenever you need to prop up your phone or gadget. Durable & Reusable. Made of flexible plastic that won't crack along its creases. This stand was designed for all generations of iPhones and iPod Touches, but also works with most other touch screen phones including the latest Android devices. Item 1: Ultra Small and portable with a BIG sound. 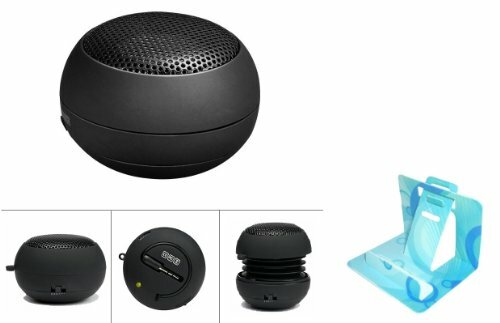 This 360 degree speaker projects fantastic sound in all directions. Expendable vacuum base. Unique vacuum bass design for surprising volume and bass response. Built in Li-Ion Rechargeable Battery giving up to 8 hours of constant playback. Compatible with ALL iPod iPhone, MP3, Phones, Laptops, PC Computers or anything else with a 3.5mm headphone socket. Integrated 3.5mm jack with dual volume control.Fits in your palm for ultimate portability. Output: 2.4W - Size: 50 x 50 x 35 mm - Frequency response: 100Hz - 20kHz - Distortion: <0.5%. Item 2: Universal Phone Stand: Credit Card Size Flexible and Adjustable Phone Stand that fits in your wallet. NOTE: This stand is a free item and might come in different colors and drawing patterns on it. If you have any questions about this product by PHONIL, contact us by completing and submitting the form below. If you are looking for a specif part number, please include it with your message.